Greeting everyone. Now that the contest is over, we can begin the voting process of which design you all would enjoying wearing and representing BZP at this years BrickFair! Please make a post with the number of your favorite design, and please only vote if you're going to BrickFair VA. If you're going to BrickFair this year. I ask for your input, as you will be the primary customers. You have one week to vote, the design with the most votes shall be this years design! After that, a separate entry will be made on deciding the colors the winning design and the overall shirt will be. 9th verse, same as the first. Welcome once more, friends. It's 2018, and that means it's the 10th anniversary of the Karda Nui saga. So rather then limiting the contest to a set or group of characters. You all have artistic freedom with this project! The only requirement is that the design must be based on the sets and story of Bionicle 2008. Something serious, or something comical? The choice is yours! Your design must also be black on a clear white background. This makes it easier for the screen printing process. You may post your entries in this thread, and have until the end of May to submit your design. The Prize: The maker of the winning design will receive a free T-Shirt! The winning design will be chosen through a voting process of the members of BZP. Colors will be suggested and chosen by the members as well. Feel free to ask any questions if needed. That's all for now. Have fun, and good luck! If you're going to BrickFair Virginia this summer, why not leave a comment of what size shirt you'd like? Whatever floats your boat. Alright. There were a few suggestions, so let's get the voting started. We need to get this over with, so I can get these tees printed. Before we vote. 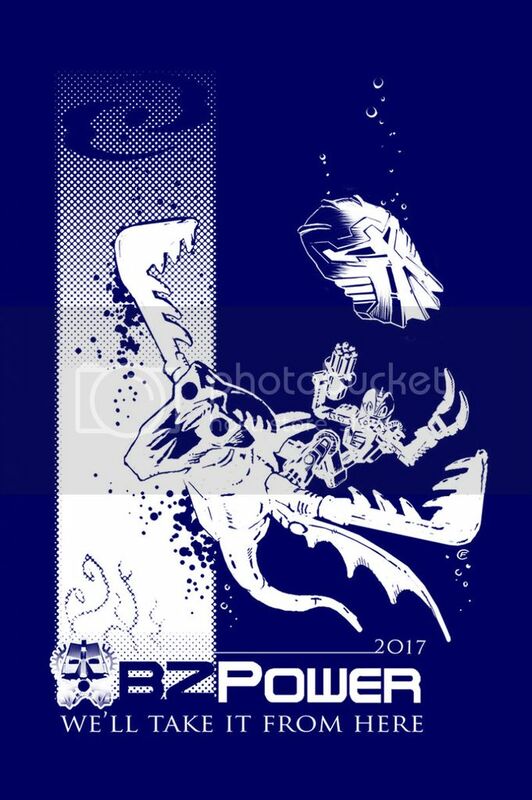 I want to stress that I get these shirts made at a local screen printing business, and they may not have the exact color paint of the winning design. I'll do the best with I've got, and I thank you for your understanding. That's all of them, please choose wisely. These shirts will be worn by all your fellow members at BrickFair. Show support for your colors, and encourage others to give their votes and input as well. You have 1 week. Now that we know what design we're using, color suggestions are open for the till Sunday. When suggesting colors, please specify the shirts color, as well as the color of the design itself. You can only have 1 color for the design, so choose your color variants wisely. Pictures of your choice are appreciated. After the entry period is done, we'll have a week of voting for the colors the forum members like the most. Thanks for reading, and have fun designing!